A 32-year-old officer from Webster Groves was shot in the face and a 41-year-old from St. Louis County was shot in the shoulder, Chief Jon Belmar told journalists at a press conference. He added that both the injured were being treated at a local hospital. The shooting broke out as the rally outside the police station was subsiding early on Thursday. A Reuters photographer at the scene said a few dozen demonstrators fled following the sound of gunfire with some screaming, "They hit a cop." The St Louis County Police chief said at least three shots were fired during the rally. No suspects have yet been identified, he added. A video has emerged featuring the moment the shots were fired. While it’s low-resolution and not much can be seen, the sounds of gunfire are distinctly heard, as well as the groaning of a man who was hit. Ferguson Lt. Col. Al Eickhoff, who is replacing the outgoing police chief Tom Jackson, earlier told the St. Louis Post-Dispatch he didn't think either of the officers were from his department. He also would not comment on the extent of their injuries. The protest outside the Ferguson Police Department began after Jackson’s resignation on Wednesday. He is the sixth city official to step down in the wake of a DoJ report last week lashing out at Ferguson's courts and Police Department for racial prejudice. 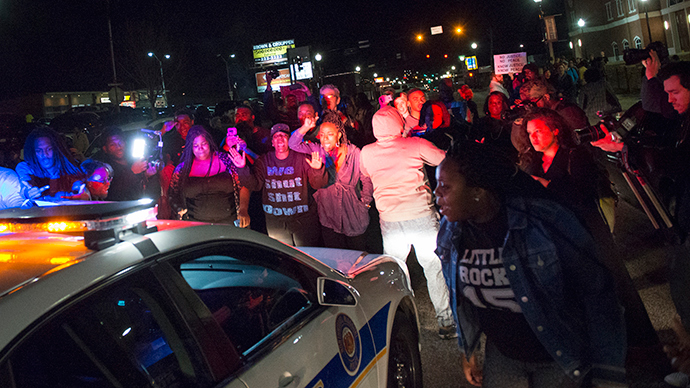 The protests at Ferguson Police Department started after Jackson’s resignation on Wednesday. The man was the sixth city official to step down in the wake of DoJ report last week lashing out at Ferguson's courts and Police Department for racial bias. The report was prompted after the US saw a wave of large-scale protests against police brutality following the shooting of unarmed black teen Michael Brown by Ferguson policeman Darren Wilson in August last year. In November, a grand jury decided not to indict Wilson.